Which Country Style is for You? The use of an authentic country kitchen color scheme is the first step in knowing how to decorate in the country kitchen style. Although the style is quite specific, there are also French country style colors to draw upon, or you could combine the two looks together, for a kitchen that has your unique style stamp on it. 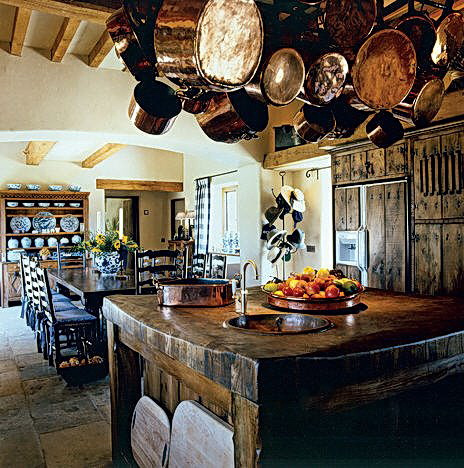 Both country kitchen looks are very casual, but also everything has a place - it is ordered clutter at it's finest. French country kitchens lean towards darker wood, and lots of copper pans, the colored elements usually coming from crock pots, bowls, and displayed crockery, rather than any table cloths or soft furnishings. 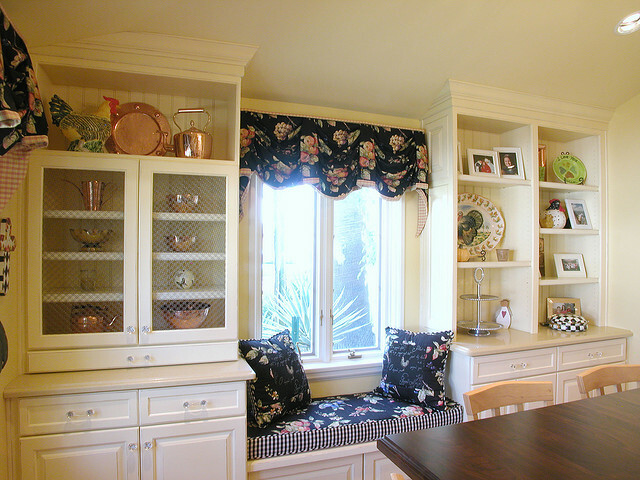 An American or English country kitchen embraces the use of color more fully with pictures on the wall, and gingham tablecloths. 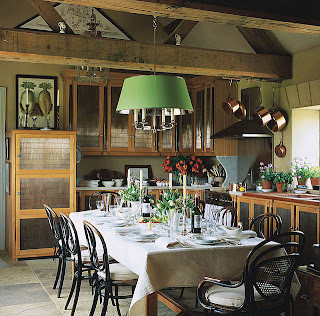 There is also the tendency for American country kitchens to have a more light and airy feel to them, rather than the grandiose dark wood of the French style. Using a country style color scheme in the home is actually very versatile. The majority of larger items in the kitchen, such as the table or island, and kitchen cabinets, would consist of an unpainted wood, therefore the color elements in the room are very easy to change to give the room a whole new look, very quickly and easily. The use of yellow and orange are also included, but usually more in the way of accent items like pots, or flowers. 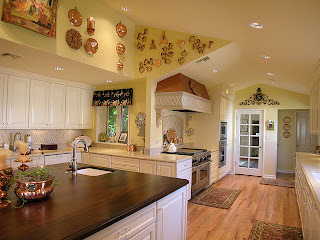 Nothing in the way of use of color is subtle in a country style kitchen. Although color can be used in smaller ways, the use of pastels is not encouraged. 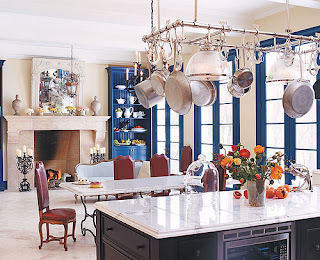 As traditional colors in a French country kitchen are awash with dark, and often unfinished wood tones, the use of color and pattern to lighten the room, and lend the air of coziness, and a communal place to meet, is very important. Even the more modern country kitchens in France that use neutral cream units, are still peppered with darker colors, such as dark wood counter tops to lend a balance to the room. Again, orange and yellow can play a small colorful role in the form of accent items, such as a pottery cockerel, but would not be used in any great expanse of space. Besides the obvious choices of painting the walls in the authentic country color scheme, there are many more ways of incorporating a taste of color into your kitchen's decor. Soft furnishings such as blinds, seat cushions, and tablecloths can add an instant splash of color and can be either plain, gingham check, or a country scene pattern. Crock pots, serving bowls and vases are also a useful way to use color. Flowers and windowsill plants are a way of naturally changing your room's color. Don't overlook the small things like cabinet door handles, candles, and salt and pepper pots. Display crockery that matches the color scheme of your country kitchen. Color can also be added with lampshades, and wall art. Whatever style or country kitchen color scheme suits you, above all make sure the overriding feel as visitors enter your kitchen is warm and welcoming, no matter what's cooking.